You are cordially invited to a pot-luck feast! Please participate in an upcoming farm-fresh blogathon. Loving Local: Celebrating the Flavors of Massachusetts will take place from Sunday, August 22, through Saturday, August 28—in other words, during Massachusetts Farmers Market Week. 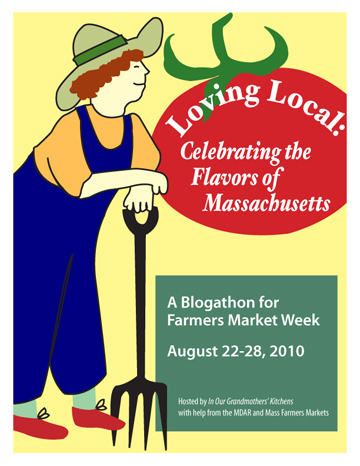 The blogathon will be hosted by In Our Grandmothers’ Kitchens, with a little help from the Massachusetts Department of Agricultural Resources and Mass Farmers Markets. We hope non-bloggers will participate as well, of course! If you are interested in food (well, who isn’t? ), please consider liking our Facebook page. We’ll keep you abreast of upcoming posts in the blogathon so you can read and comment. And when it begins you’ll have lots of yummy posts to savor! Funds raised during the blogathon (bloggers who participate will be encouraged to place a donation link in their posts) will go to Mass Farmers Markets, a non-profit charitable organization that helps farmers markets throughout the Commonwealth. Please think about writing a post that week if you live or work in Massachusetts. Or if you used to live or work in Massachusetts. Or if you once spent a weekend on Cape Cod. Or if you have a particular fondness for New England clam chowder, Hadley asparagus, or Boston baked beans. Posts should focus to some extent on locally grown food in Massachusetts. You don’t have to be a food writer to participate, however. Gardeners can write about herb or vegetable growing. Architects can write about the design of barns or farm stands. Watchers of the statehouse or even the federal Capitol can discuss the politics of agriculture and/or local food. And so forth. 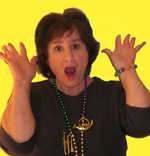 Posts can be recipes, critiques, short stories, reminiscences … whatever you feel like writing. Let the flavors of the Bay State inspire you. Here’s how you can get involved: Sometime during the week of August 22-28, put your post on the internet. 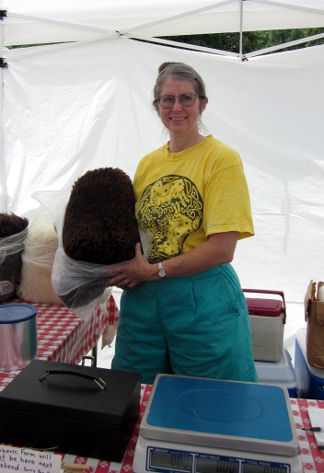 Please make sure your post mentions the blogathon, includes a link to In Our Grandmothers’ Kitchens, and encourages readers to donate to Mass Farmers Markets. The organization’s donation link is http://www.massfarmersmarkets.org/FMFM_Main.aspx. Of course, we’d love to have bloggers show off our gorgeous logo, designed by the talented Leon Peters. You may also display a PDF poster in 8-1/2-by-11-inch format. If you’d like to participate, please leave a comment here or on our Facebook page to tell us what you’d like to write about. When the big week arrives and you’ve put up your post, you may either leave another comment or email lovinglocalATearthlink.net to announce it. All posts will be identified with a link on this blog as well as on a special site set up just for that purpose, the Loving Local Blog. And please help spread the word about this event! We hope our table during Farmers Market Week will be bursting with flavorful, colorful surprises. P.S. 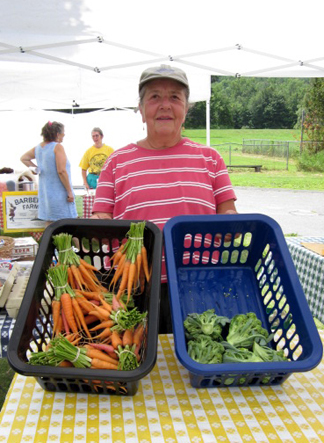 In keeping with the Farmers Market Week theme, here are a couple of photos from this past Saturday's doings at the state’s newest and probably smallest farmers market, that in Charlemont, Massachusetts. Below you can see Sheila Velazquez of Pen and Plow Farm in Hawley show off her veggies—and Barbara Goodchild of Barberic Farm in Shelburne display some fleece from her sheep. There was only one other booth last weekend–a bake sale for the local school–but food was fresh and spirits were high. I recently checked into my Twitter account—and one of my fellow Tweeters had posted a morning thought that clocked in far below the 140-character maximum allowed by that social network: “I LOVE SUMMER!” I couldn’t have said it (or rather typed it) better or more succinctly myself. I love the sun, the greenery, the long evenings of music and camaraderie, the swimming—the sense of literal and figurative immersion we feel in this season. My only complaint about summer is that it is so fleeting. The relativity of time is particularly apparent at this time of year; the plodding pace of mud season has given way to summer’s gallop. Our local Bridge of Flowers Road Race (coming up on August 8!) is a telling symbol of the velocity of summer life in our area. Suddenly each day, each night, each weekend overflows with activities. And the summer flies by before we know it. There’s never enough time in July and August to spend preparing complicated dishes. Luckily our local farm stands and Farmers’ Markets provide us with plenty of fresh produce that cooks up into a quick summer meal. The corn may not yet be as high as an elephant’s eye, but it has certainly surpassed the height of my dog Truffle. We’re beginning to get that summery vegetable plus flavor-filled tomatoes, crisp greens, resilient beans, shockingly bright carrots, tender broccoli, delicate nectarines, and even baby potatoes. The Farmers’ Markets also offer oven-fresh bread for those of us (like me) who can’t be bothered with baking the stuff in warm weather. The Shelburne Falls, Massachusetts, Farmers’ Market has just made life simpler for fresh-food lovers by publishing The Shelburne Falls Farmers Market Cookbook. This slim volume provides information about common (and a few uncommon) vegetables in our area. It also offers recipes from vendors and food lovers that take advantage of the season’s bounty. 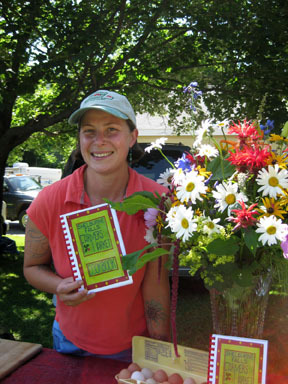 Put together by the market’s organizer, Ivy Palmer of Pitchfork Farm in East Charlemont, the book is lively and useful. Ivy obtained a grant from the Massachusetts Department of Agricultural Resources to help defray the costs of the booklet; profits will help maintain the market. Leafing through the book, I’ve found a number of recipes I want to prepare—and I know I’m not the only one! 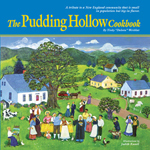 Last time I went to the market I saw a Shelburne Falls resident who wants to remain anonymous purchase a copy from Ivy the minute she heard that a special recipe she had already tried was in the book. I have a couple of tiny complaints about the cookbook. One is that the recipes don’t tend to provide a yield; that is, you have to use your common sense (or wait and see!) to determine how many people the dishes serve. The second is that we don’t get much information about the individuals who contributed recipes. Always curious about my neighbors, I want to know who they are and where they live. Despite these minor quibbles, I know I’ll be cooking out of this book a lot this summer and in summers to come. 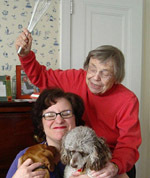 Ivy has given me permission to offer a few of the recipes on these pages. I hope they will encourage readers to visit her market and others and to grab and use all that lovely summer produce—before it disappears like a runner in the Road Race! My first try at cooking out of the cookbook couldn’t be easier—or tastier! I have adapted it slightly to reflect the produce I had on hand. Cook the beans in boiling lightly salted water for 5 to 7 minutes, until they are ALMOST done. Remove them from the pot, and drain them. In the pot you used for the beans melt the butter. Add the garlic, and sauté lightly for 1 to 2 minutes. Add the beans, salt, and pepper, and toss lightly for a minute or two. 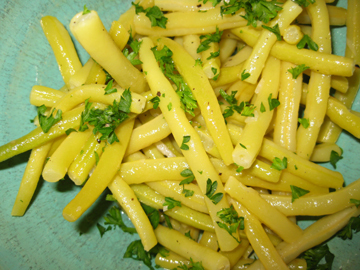 Put the beans in a serving dish, and sprinkle parsley over them. Serves 4.